Have you guys heard about The Black Tux? If you haven't, it's a cryin' shame. This awesome company is "not your traditional online suit & tux company." They offer quality & convenience. A tux or suit shipped right to your door? How handy this would have been for our wedding 6 years ago!! We decided to infuse in the Pantone 2016 Colors of the Year; Rose Quartz & Serenity. Both colors are beyond beautiful. I wracked my brain for the perfect outfit to match the perfect suit or tux & finally decided on something versatile. Are you guys even surprised? I thought about going all out & getting glamorous & decided that that isn't quite the life I lead... so versatile, comfortable & classy it is. This gorgeous dress from Asos stuck in my mind from the first time I saw it. It struck me as sleek, modern, feminine with a classy 80's twist. I couldn't pass it up. 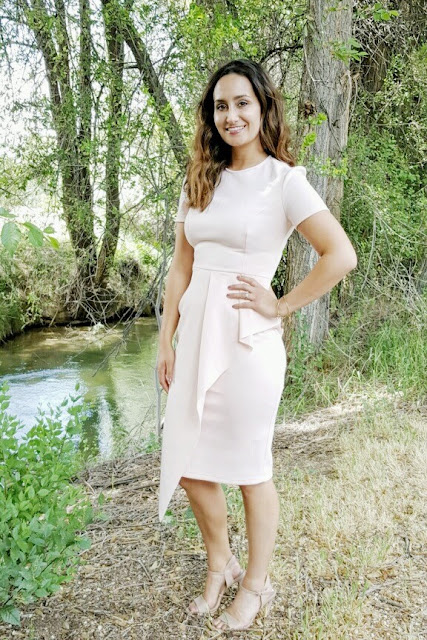 Depending on the occasion, this dress could be paired with a black heel & darker accessories. Or you could brighten it up and keep it more casual with white heels & a pop of Serenity with a statement necklace. 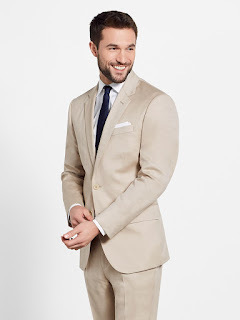 I loved the Tan Suit for a Summer wedding look. This is definitely a more casual look, which fits into our lifestyle. I would pair the suit with the Navy Neck Tie for some contrast. Head on over to The Black Tux, if you are ever in need of a great deal on a quality tux.